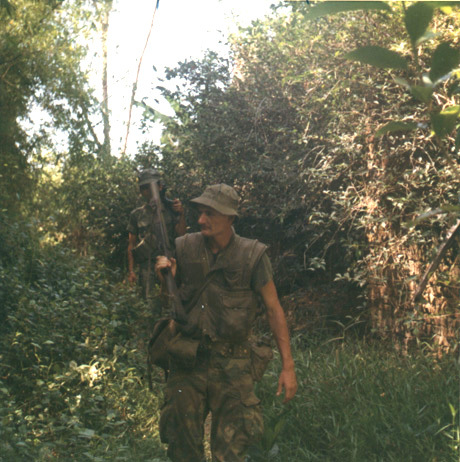 Casey “Country” Roach of Colton, Calif., is shown in this rare photo taken on patrol in an overgrown area of the CAP 2-7-2 TAOR. He is followed down the trail by one of our Regional Force troopers. He is dressed in typical patrol gear wearing a soft cover, flak jacket (M-26 grenades in pocket), pistol belt and canteen. The bag slung over his left shoulder probably holds extra ammo for his M-79 grenade launcher.